Probably supplied to William Fergusson of Raith, Kircaldy, Fife and by descent. The commodes are elegantly serpentined in the French fashion adopted around 1780 by George, Prince of Wales, later George IV in the furnishing of his apartments at the Queen's House, now Buckingham Palace. The Prince's taste was later popularised by Messrs. A. Hepplewhite & Co's The Cabinet-Maker and Upholsterer's Guide, 1788, which illustrated a four-drawer 'Commode Dressing Table' with serpentined apron and feet of this pattern (pl. 77). These 'commode-tables' may have been commissioned for the window-piers of the principal bedroom, and its adjoining dressing-room, at Raith Park, Fife by William Ferguson, following his inheritance of the estate in 1781. The latter was portrayed in a celebrated painting by Johann Zoffany being welcomed in 1769 as the heir to Raith by his uncle Robert Ferguson (d. 178l) (see R.M. Ferguson, Records of the Clan and Name of Ferguson, Edinburgh, 1895 and M. Webster, Johann Zoffany, London, 1976, no.52). The son of David Berry and Mary Ferguson, William Ferguson adopted his mother's surname following his inheritance. ... Mahogany chest of 3 long drawers & sliding writing board [presumable the top drawer], shaped front'. ... Mahogany chest of 4 long drawers, shaped front, brass handles'. 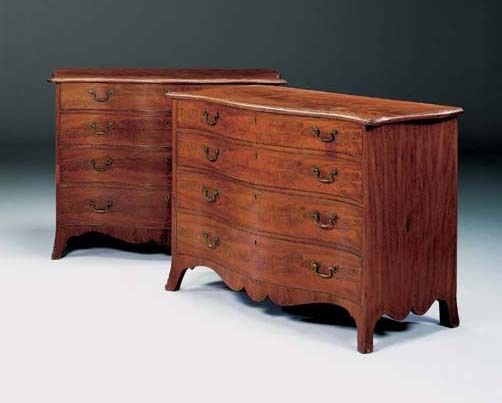 'Two mahogany serpentine front chests of four long drawers, each on shaped feet, brass handles'.